Penelope Gilbert is the biological daughter of Grayson and Miranda Gilbert. She is the older sister of Jeremy Gilbert. When Penelope was a few days old, Grayson and Miranda adopted a baby girl named Elena who became Penelope's younger twin sister. Penelope and Elena didn't get along while growing up. Even though Penelope adores her younger sister, Elena is envious of Penelope because she thinks that their parents favor Penelope more than her. When Penelope was sixteen-years-old, her younger sister left the house to go to a party while she stayed behind to play games with her parents and younger brother. Her life changed when her parents get a phone call from Elena asking them to pick her up from the party which they did, but they never return while Elena was taken to a hospital. On Penelope's first day of school as a junior, she meets a mysterious man who will somehow make her life better or worst. I do not own the characters in this story except for Penelope Gilbert. - Started on November 21, 2018. Cotton Grace Salvatore is the only daughter of Stefan Salvatore. Her mother, his late wife, died shortly after giving birth to her. Her father raised her from a baby and changed her when she was 16 years old. Cotton is the mate to Elijah and Niklaus Mikaelson. See how her overprotective father handles his little girl having mates. My name is Ariel Gilbert. I'm the oldest Gilbert. I'm popular for my eyes. They're a color that had never been seen in eyes before, purple. My parents don't know how I got purple eyes but they loved them before they died. My younger siblings Elena and Jeremy are so worried about me since Im a mute. That's right Im a popular purple-eyed mute. I stopped talking when my parents died and I still don't talk. 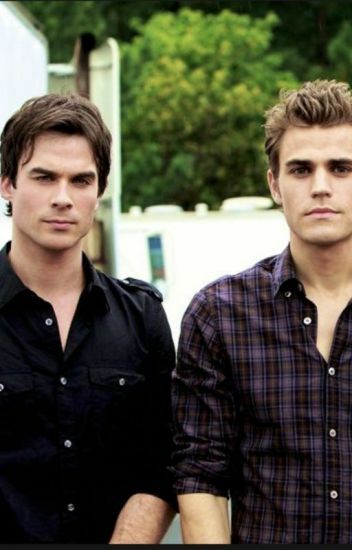 The Salvatore brothers are my best friends. They learned sign language for me and everything. Their everything you could want in a friend  especially Damon. Damon is awesome and is very protective. When we go places and guys flirt with me he threatens them and says that I'm not interested. That is all before I meet him.....Elijah Mikaelson. Freya is still alive she is a vampire instead of a witch. Esther never comes back to the living. Finn is awesome instead of stuck up. This sorta follows the show but not a lot. This is an AU of tvd and the originals and they're going to be people I kill off if they piss me off and some people are going to have different personalities just word of warning and I'm gonna change things, I also might bring in different tv shows idk right now. TRIGGER WARNING: I do write some things that may trigger you so read at your own risk but enjoy!! Being the adopted daughter of Klaus Mikaelson and the mate of Kol Mikaelson.
" All this time, I have believed that Tatia or Katerina would be my mate, but I would never have thought that they would somehow connect me to my true mate. Azalea Salvatore, you are my other half, and I would do whatever it takes to make you happy and safe," Elijah to Azalea. Azalea Salvatore is the only daughter of Stefan Salvatore and Katherine Pierce/Katerina Petrova. Before Katherine met Stefan and fell in love with him, the female vampire saved a female Witch name Emily Bennett from getting killed. Emily felt grateful and thus gave Katherine the ability to bear a child with her true love. In the beginning, Katherine didn't believe Emily's words, but after meeting Stefan and falling in love with him. The female vampire was shocked when she found out that she is expecting a child of Stefan. She confessed to Stefan and for a second was scared that he would reject her, but was surprised when Stefan showered her with love and affection. Katherine's pregnancy was unique since Stefan was a human when he met Katherine who is a female vampire. After Katherine gave birth to a beautiful baby girl, they found out that their daughter is a vampire hybrid. Katherine and Stefan fell in love with their daughter and thus decided to name her Azalea after Katherine's favorite flower. I do not own the characters in this story except for Azalea Salvatore. What if Mason Lockwood was happily married to the love of his life? Until Katherine came along that is. With her bad and wicked intentions, she sweeps Mason away; leaving his wife alone and heartbroken. Elsa Lockwood thought she had found the love of her life until one day he just leaves her; but what he didn't know was that she had been carrying his child. With a broken heart, Elsa runs back to her family... The Gilberts. There she will not only reunite with family but find love in someone who believed he couldn't be loved. And in return, he will mend her brokenness. Niklaus 'Klaus' Mikaelson has a weakness that only his family knows. Klaus' weakness is that he still feels guilty about what happened to his beloved younger brother, Henrik Mikaelson. He believes that it is his fault that a werewolf killed Henrik. To Klaus' surprise, many centuries later, he finds a scared little boy in a Museum at New York that resembles his dear younger brother. Klaus confronted the young boy and asked him for his name. He is even more shock when he finds out that the little boy's name is Henry which is a similar name to Henrik and that his last name is Gilbert. Klaus can't help but think he was given a second chance to protect his younger brother. Even though he knows that Henry isn't technically his younger brother, he will do whatever it takes to defend and make him happy. I do not own the characters in this story, except for Henry Gilbert.